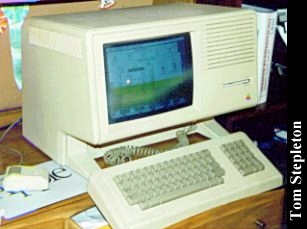 Inspired by Xerox's new idea, the GUI, the Apple Lisa was, in 1982-83, Apple's attempt at making a revolution in computers. 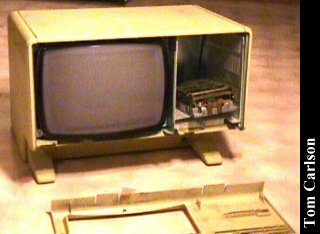 High price doomed it to the fate of other early GUI-based machines like the Xerox Star, and the introduction of the Macintosh in 1984 was its death knell. 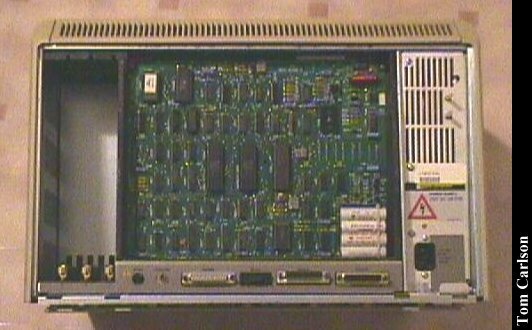 This Lisa is, according to the Owner's guide, a Lisa 2/10. 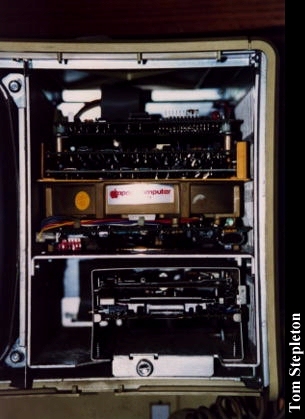 Underneath the hood is one meg of RAM, a 10mb hard drive (hence the 10 in 2/10), an 800k 3.5' floppy drive (replacing the original 400k), and a Motorola 68000 chip. 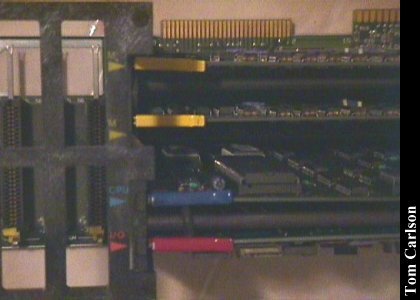 The innards are of a modular construction: the motherboard and daughterboards come out from the cavity in a plastic "cage", turning a knob and pulling will take out the storage media devices and their controller (known as the "Lisa Widget Controller") in a metal rack, and another knob will pull out the power supply. All this is accomplished with little or no removal of wires. 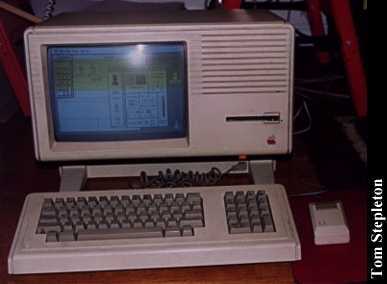 Currently, this Lisa runs a special version of the Macintosh Operating System distributed by Sun Remarketing which makes it, except for sounds and the unorthodox keyboard, a fine (albeit slow) Mac. 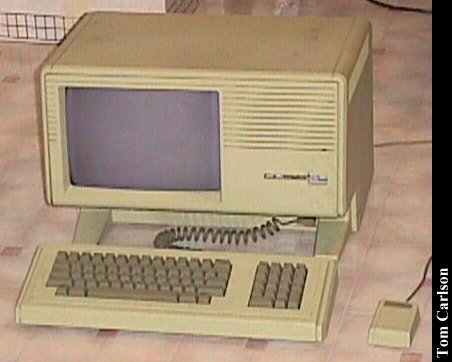 Plans are underway to restore the original operating system, the Lisa Office System 7/7. 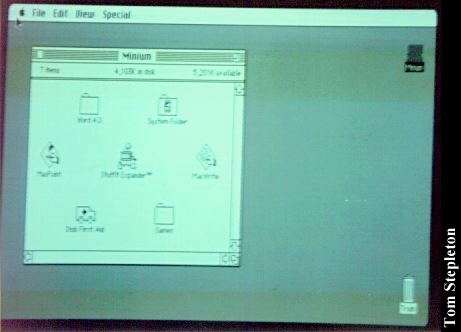 Here's a screen shot of the Lisa as a Mac. Not much to say here except to note the vertical length of the trash can, demonstrating the Lisa's odd screen aspect ratio. 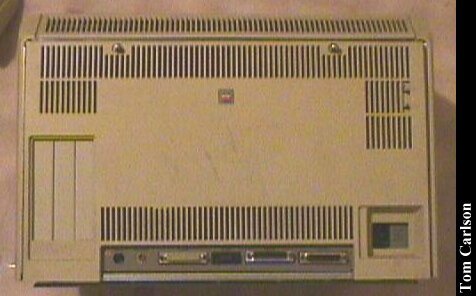 Here's a close-up of what's behind the right side of the CRT; the round thing with the "Apple Computer" logo is the 10mb HD, below that is the 800k disk drive, and above the HD are the controller cards that make up the Lisa Widget Controller. 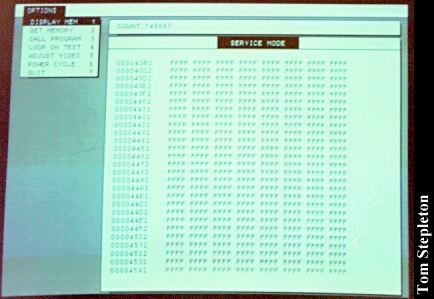 The Lisa has a program in ROM known as Service Mode. 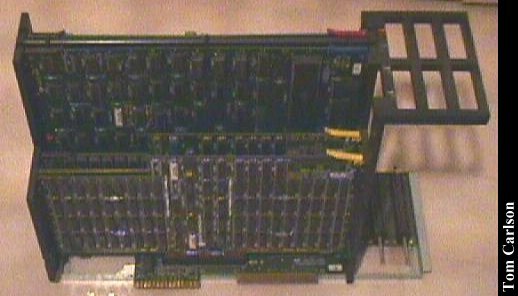 For interested Lisa users out there, this is accessed by hitting any key during the power-on test, then in the Startup-From menu telling the Lisa to mount from a non-existant volume (like a floppy that isn't there). When you see the error-message, type Apple-S, and there you are. 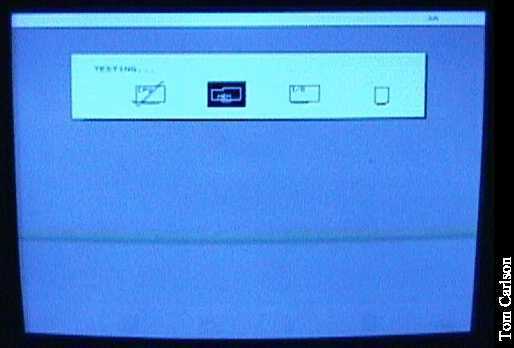 From there you can access a test pattern to adjust video, loop on any of the power-on tests, power-cycle, even read and write directly to RAM, then call memory addresses! 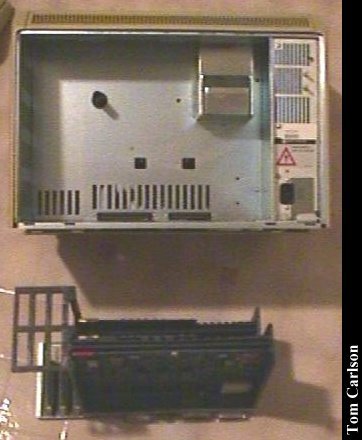 The GUI and the front panel switches of lore meet here. 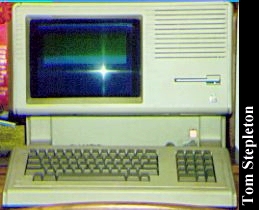 Front view with ProFile hard drive (?) sitting on top. 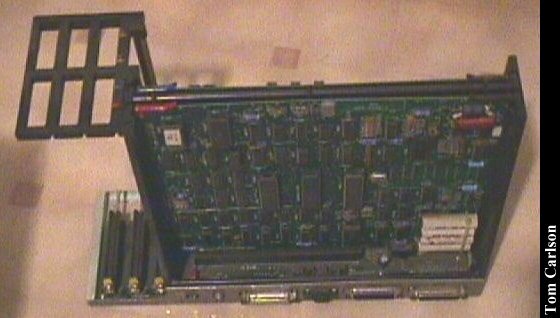 Front view with drive cage removed. 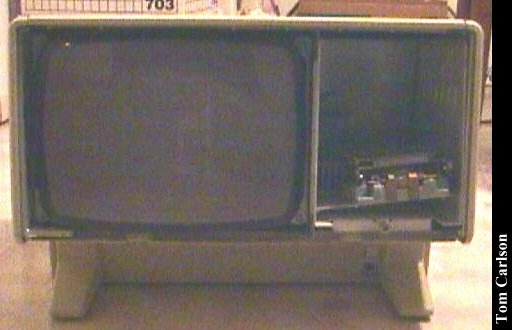 Rear view with rear cover on. Read view with rear cover removed. 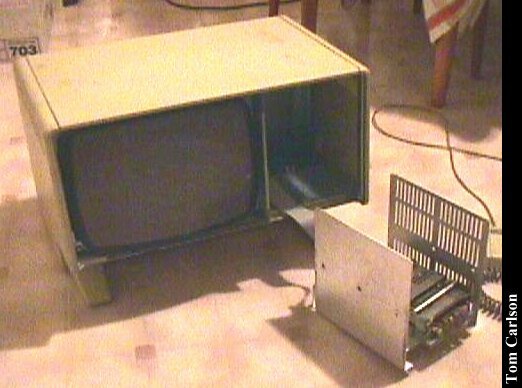 Rear view with circuit board and expansion board cage removed. Close up of top of circuit boards. 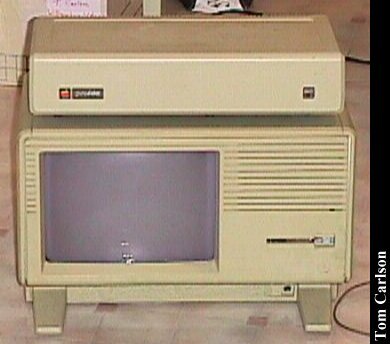 Click here to view all comments for the Apple Lisa and to leave your own.